Kicking off the Farmers in the Valley Tours is a visit to Ekonk Hill Turkey Farm’s “9th Annual Spring Ice Cream Social” on Saturday, March 18th, starting at 11 am. Gobble up some free homemade ice cream & make your own sundae at the toppings bar! Scoop up family fun & talk turkey with The Last Green Valley Rangers. A sweet way to celebrate the arrival of spring at amazingly scenic Ekonk Hill Turkey Farm at 227 Ekonk Hill Road (Route 49) in Sterling, CT. Morning Beckons Farm calls you in for the “7th Annual North American Shearing Contest” on Saturday, June 24th, from 8 am – 4 pm. 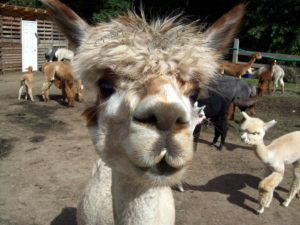 This is a hair-raising excuse to visit the largest alpaca farm in the northeast! Watch the fleece fly at the Shearing Contest, a free event that is open to the public. Walk the farm and check out the other interesting animals living there, too. Visit the farm store for alpaca-related products and great gift ideas. The Last Green Valley Rangers will be on hand at this partner farm located at 343A Sand Dam Road in Thompson, CT.
Ice Cream and Bluegrass are the perfect combination for a summer day, and Fort Hill Farms, one of the six family farms that make up The Farmer’s Cow, is offering you the chance to enjoy both at their “National Ice Cream Day Bluegrass Bash” on Sunday, July 16th, from 1 – 3 pm. This diversified farm has been in continuous agricultural production for more than 300 years. Three generations work on this scenic and historic site, and three states can be seen from the peak of Fort Hill, a spectacular setting with breathtaking views. Tap your toes, taste local ice cream, and learn about The Last Green Valley with our Rangers! Find Fort Hill Farms at 260 Quaddick Road in Thompson, CT.
Fresh sweet corn calls you to Cushman Farm, another of the six family farms that make up The Farmer’s Cow. Enjoy a “Corn Roast in the Hayfield & Farm Tour” on Saturday, August 5th, from 1 – 3 pm. What started on 155 acres at the homestead has grown into nearly 1,800 acres of cropland in three towns managed by the 6th generation of the Cushman & Smith families. The newest dairy complex includes a rotary parlor that milks 30 cows at a time, and a barn big enough for 900 cows. Enjoy freshly picked local sweet corn! And, the cows will be glad to show you their home. Mooove on over to visit with The Last Green Valley Rangers, too. Cushman Farm is located at 393 Lebanon Avenue, North Franklin, CT. The final tour event is TLGV’s annual fundraiser with a new twist. This year, Tastes of the Valley presents “A Farmer at Your Table” on Sunday, August 27, at the Publick House Historic Inn in Sturbridge, MA. Enjoy the new flavor at this event – a seated 5-course gourmet dinner. Locally-grown products will be cooked up into unique tastes by top chefs, all from our National Heritage Corridor, and you will dine with guest agri-superstars & TLGV notables as they move from table to table with each course. The auction items, raffle baskets and pledge forms will be present, too, but look for a whole new course of fun and fundraising opportunities. This event will be like nothing you’ve tasted before, so join in to support TLGV’s diverse programming. Made up of 77% farmlands and forests, The Last Green Valley National Heritage Corridor is a 35 town region in eastern Connecticut and south-central Massachusetts. You can find dairy farms, orchards, vegetable farms, herds of beef, bison, alpaca, goats, sheep, and flocks of poultry, including the largest bison, alpaca and free-range turkey farms in Connecticut. Celebrate the diverse agriculture by accepting the invitation and tour some of TLGV’s partner farms this year! Learn more about the National Heritage Corridor, the rich agriculture and agritourism in the region, plus events, news and more at The Last Green Valley’s website, www.thelastgreenvalley.org. Keep up to date on TLGV’s Facebook page and Instagram, too. ← Spring Outdoors in The Last Green Valley! News for 2017.